Montrail Ultra Cup - 26th Mtn Masochist set to start at 6:30am tomorrow! Everything is in place and runners will start arriving in a few short hours for the 26th running of a great event - the MMTR 50 Miler. As this is my first year directing this event, I just hope that everyone involved will continue to enjoy the MMTR experience as in year's past. In many ways, coming to this race is like homecoming. You get to see so many runners that are like family - some who have run the race over 20 times all the way to many who are newbies to the sport. The women's field this year is not a deep as in years past but will nonetheless be an interesting race. The men's race is gonna be a barn-burner! Returning champ, Zach Miller (7:04), and past Champ, Eric Grossman (6:53) just went head to head at the Tussy 50 Miler and will do it again tomorrow along with Lon Freeman, Sean Andrish, Jeremy Ramsey, Jonathan Basham, and about 3 or 4 others who could vie for a top spot. Remember, as part of the Montrail Ultra Cup, the top 3 men and women have automatic bids into the 2009 Western States 100 mile Endurance Run. Also, in addition to this excitement, David Horton (former RD) is running the race! David's last time racing MMTR was the very first year, when he started the event in 1983. David won that year and, in honor of that and all he has done for the MMTR and the sport, he will be wearing number one tomorrow. Follow the link above to the MMTR website and click on the Live Results link to follow all the action tomorrow. 1997 MMTR winner (who also set the course record at that time in 6:57) JOSH COX, a 2:13 marathoner and former college teammate of mine put together the following video for this year's MMTR. It's a tribute slide show highlighting all the tradition that makes MMTR so great. Too bad Josh can't make it to MMTR this year. He'll be in NYC for the marathon - doing his thing! Thanks JC! Today 19 folks ran the 2nd half of the MMTR course. We left Lynchburg at 5:30 am, met in Montebello at 6:30, shuttled back to Long Mtn Wayside and were running by 7:30am. The temps stayed in the low 40's all morning and the colors were incredible! 23 miles for the day which is my first run over 20 in a long, long time. I felt surprisingly well and ran pretty good - all things considered. Around half-way into the run, I felt the wheels starting to come off but some wonderful trail work saved me. In order to clean up parts of the MMTR course, I "needed" to keep stopping, clear trail, as well as take a break! It worked perfect and finished the run with only minor cramping. 3) I'm 0 & 2 in 100km races. 4) I really need geographical convenience. So, here I go. I'm making this public to keep me going. The 2008 Holiday Lake 50k++ was my first race in about 3 years and even though that performance was a disappointing 12th place, I felt like I was back on track with my training. By early May I was beginning to feel like my old-racing self and had entered in Highland Sky 40. Two weeks before the race though, I sprained my ankle...playing hockey! It was much worse than I initially realized and ended up not running a step until late August (although I did get in some decent hiking on my Rocky Mtns tour this summer). The ankle still is limited in its range of motion but I can run pain-free, at least I think. I haven't been running much this fall. I can find all kinds of excuses why - new job responsibilities, new race directing, family - you name it but the bottom line is that I haven't been running. In September I logged less than 200 miles for the month and so far in October, I've logged less than 40 miles. All in all, since May I've ran less than 300 miles. I have just under 2 months before I toe the line. I plan to blog about my training here, for good or for worse, and then attempt to finish Hellgate. I'm positive I'll be a sorry sight on race day but I'm looking forward to the challenge and testing myself once again. I'm now going for my first training run for Hellgate. On one hand, everything is good in moderation. On the other, anything worth doing is worth overdoing. I spent six or seven months seriously dedicated to making sure that 100 miles in the mountains was still in my zone of moderation while pushing farther and harder than anything else I had attempted. Though I attacked my training for the Grindstone 100 with a level of dedication that forced me into a mildly antisocial, sober, reclusive spell, I showed up to the starting line blissfully ignorant of what a finish on the Grindstone course would mean. I knew the bare minimums: I had 38 hours to run 100.73 miles, which at that pace worked out to 22:38 minute miles, and there were roughly 23,200 feet of climb and the same distance down. Honestly that was all I knew. I listened half heartedly to the prerace brief because I knew that at that point, the information was too little too late. I did catch a lot of “this part will eat your lunch,” which left me both curious and slightly shaken in my confidence. My prerace plan was to endear myself to a salty, experienced ultra runner and hang with him for at least the first night. I was lucky enough to meet Dave Snipes, and he agreed to pace me and his friends to our first 100 mile finish, somewhere in the 34 hour pace group, and I felt fulfilled as far as my prerace plan was concerned. We took off and during that first night, I knew I was going too fast. I knew I was attacking the down hills too aggressively, but I knew that I was trading caution for companionship, and within hours I had settled into a comfortable group of four. Dave in the lead, I followed closely enough to clip his heels every so often. For the first 20 or 30 miles, I felt great, my legs continued to feel fresh even after many long climbs. I refused to acknowledge each daunting climb, and it was easy because the night limited my vision to an 8 square foot circle that my head lamp illuminated. The only thing I really focused on was Dave’s footwork, which made the hills much less intimidating than seeing mountains rise up before you knowing you had to go up there. I remembered Mr. Clark Zealand’s prerace brief, “go out there and enjoy the beauty of god’s creation,” which I’m sure he delivered with a slight smirk. I guess I finally got the joke: I saw many many miles of the beautiful mountain trails pass by foot by foot. All things are good in moderation. We made it to the turn around before sunrise, but once day broke that was more or less the end of my feelings of going too fast. I had one final surge, one final high of the day: I sprinted down a hill to catch up with my group and sang Oklahoma’s “Oh what a beautiful mornin’,” at the top of my lungs. If I passed you as you were climbing that hill and you thought I was being cocky or obnoxious, surely justice was dealt as I neither sang nor sprinted for the rest of the day, and going fast was only a memory of times gone past. I hung in there with Dave for the better part of 20 hours, but I lost the ability to descend, and could not keep pace. I fell a lot. I swore a lot. I cried, despite the promises I made myself to scrape it together until I reached a respectable distance. I made it to mile 80. My brother paced me from Dowells Draft, and it was very frustrating for me to know I had less than a 50k left but it would take me probably 12 hours. I collapsed on the trail for a little bit, watched as runners passed me. I got it together and with the help of my brother, reached the second to last aid station. There my sister joined us, and the three of us set off for the remaining 15 miles. Those miles were long, they were painful, they were frustrating, but I am grateful they were not lonely or desperate. I took comfort in the fact that forward progress, granted painfully slow, amounts to something eventually. The beauty of the course was not lost on my sister, who reminded me that the sunset, the views of the mountains, the trees, the leaves, the streams, the stars were all things we were lucky to behold. I didn’t tell her that I had been lucky to have been beholding all these wonders for 24 or more hours, because there was no need to be spiteful, but it is further evidence for the saying that anything worth doing is worth overdoing. She was right; the second sunset was a sight I felt fortunate to see. The course got familiar; I knew we were getting closer to the finish. I knew that despite the pain, there was nothing, save a cougar or bear that would stop me from finishing the Grindstone 100. A little before 2 in the morning on Sunday, 5 October, I crossed the finish line with my younger brother and older sister as my dad watched. Even when things got bad, I knew I was doing what I love to do. Though I will race again, I feel fortunate that this time next year I will be safely deployed in the war on terror, far and away from Swoope, Virginia. I say this, but surely if I find myself next October near the starting line, the challenge, companionship, beauty and intensity of the race will pull me such that I will likely find myself at the finish. I am proud to have finished in the inaugural year, I am exceptionally proud of the first half of my race before the bottom fell out. I am proud to say my first 100 miler was a hard one. More importantly, I have many people to thank and I feel a great sense of indebtedness to my crew. Thank you to the volunteers and aid station workers. Thank you Dave Snipes for lending me your expertise. Thank you to my sister and brother for sticking with me on that last stretch. Thanks to my aunt and her boyfriend, my father, my family that were pulling for me from afar. Thank you to my friends who were supportive and understanding during the entire weekend and my reclusive training spell. Thank you all, because without your help, there would be little to be proud of. A 100-mile race is the perfect study break. The Grindstone 100 fell right in the middle of midterm exam season at William & Mary, which was beautiful timing because tapering afforded me extra time to spend in the library. Yet I started the race apprehensive of all the homework time I would miss while racing, as well as…you know, the concerns associated with actually completing 100 miles. Most of my training takes place in the formidable mountain ranges of Colonial Williamsburg, so I forget what it feels like to experience an elevation change. P1: Sabrina will finish the race, or Sabrina will quit. P2: If Sabrina finishes the race, she will be tired. P3: If Sabrina quits, she will be frustrated. C1: Sabrina will be tired, or she will be frustrated. P4: Sabrina is not frustrated. C2: Sabrina did not quit. Conclusion 1 by Constructive Dilemma, Conclusion 2 by Modus Tollens. The best part about this event was spending time with the other runners. The ultra world is such an amazing community, and everyone is so friendly and welcoming. I look forward to seeing everyone at future races. Thanks so much for making my experience at the Grindstone so much fun! 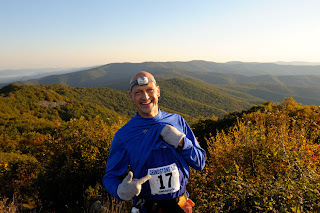 Trail runners for some time had all been talking about one race this year, the Grindstone 100. The word (Grindstone) was passed around like folklore. Some comments made the race sound almost other worldly, other comments made the race seem purely masochist. After running Hellgate I knew that I wanted to run the Grindstone. My description for the Grindstone is BRUTAL. The entire 100 miles you are either climbing or descending. The climbs I rate as monster, huge, big, and climbs. There are a few spots of relief , but they are very short. The race is an honest run. Honest meaning that the course is not going to give you anything. The course gives you nothing but climb after climb, miles and miles of rocks, steep descents, and some beautiful sights. The hardest time for me was within the first twenty miles. I had already fallen twice and I was having some hydration issues, but as I entered the third aid station I refilled my fuels and left quickly. I did not want to give myself the option of quitting. It was not long after aid station three that the voices in my head decided to give up, and let me run in peace. I feel that the climb out of aid station five was the longest. I was well rewarded when the trees parted at the top of the wild oak trail, because the night sky was breathtaking. I had not seen stars like that since my time in Iraq during Desert Storm. I started to run with Stephen Baker after aid station six and enjoyed the company. We had both ran the training runs and knew that it was easier running on the return trip. Still the course was tough and especially the descent back down to the north river gap aid station. 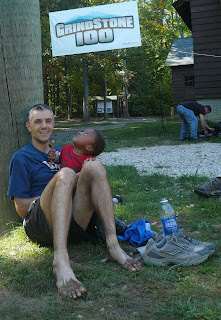 I continued on from north river gap aid station by myself and kept only one idea in mind-keep moving forward. Coming back into the Dowells draft aid station I had a burst of energy and enjoyed every minute. I realized that I could finish before dark and that was enough to keep me in very good spirits. As strange as it may sound I really did have a good time. I kept my momentum going on to the finish line, but I did have one nasty fall about two and a half miles from the finish. I could not think of a worst place to fall but I did and it hurt, but the pain from falling and the miles of running were coming to an end. The step that means the most in all ultra races finally approached the finish line step. I hugged the totem and received my buckle. I could think of no better way to spend a weekend in the mountains. I would like to congratulate Dr. Zealand on the Grindstone. It was fantastic. All of the aid stations were great and eager to help. The aid stations were well stocked and very filling. The Grindstone was all that it was expected to be and then-some. I am already planning on next year. Thanks again and see you at Mountain Masochist. This was my first 100 mile race and I must say, it was quite an experience, an experience that would not have been possible without the great crew support I had from my wife (Debbie) and kids (Ashley, Genna, Abby, and Joshua), parents (Wayne and Betty), and my sister (Amy). They were amazing and extremely tolerant of a cranky runner, you have my thanks and love. I would also like to send out a heartfelt thanks to all of the awesome volunteers, your support was tremendous and the aid stations were top notch. I have been running Ultras for just over a year and have dedicated my efforts this year towards raising funds and awareness for the Injured Marine Semper Fi Fund. Training for this event started back in February when I decided to enter the Beast Series. This would have been my 2nd 100 mile attempt this year but unfortunately the Western States 100 was cancelled. Well we started off the day early Friday morning with a drive from Fairfax to the Shenandoah Boy Scout Camp. I tried to get some rest on the ride over but a little anxiety prohibited that. Dr. Horton provided a great motivational course overview and came just short of saying that 50% of us would never be heard from again, so that really boosted my confidence. The only part of the course that I had run was from Falls Hollow to the top of Elliot Knob and Crawford Mountain and back, so the rest of the course was a mystery to me. As we "toed the line" in front of the Shenandoah Boy Scout Camp waiting for the start, I must say that I was very anxious to get started and was curious to see how the late start would effect me. The first 5.7 miles to the Falls Hollow aid station were uneventful. The pack started to thin out right away as everyone settled in for the long haul. It was good to be running and I was grateful for the little remaining daylight that we had. The climb up Elliot and Crawford was just a hard as I remembered from my training run and it was a welcome relief to roll into Dowell's Draft and see my crew for the first time. The climbs on this course were brutal and any downhill sections on the outbound leg were considered a mixed blessing, knowing that they would soon become uphill climbs on the return trip. The section between Dowell's and North River Gap went fairly well and I felt like I was making pretty good time. The weather could not have been any better and I had to turn the light off a couple of times to admire the stars above, what a clear night. awake) was present and would stay with me the rest of the race. It was great to see them, they had a cup of coffee, which was badly needed and provided awesome encouragement, which was also badly needed to get me back up Reddish Knob. A little over half way through the race at just over 12 hours, I was feeling pretty good but could feel the fatigue and knew that the return was not going to be easy. I was getting close to entering distances that I had not previously experienced. The run across the ridge to Little Bald and Grindstone Mountain was incredible, beautiful sunrise and cool temps kept me motivated and moving. The 6.5 miles down Grindstone went on for a long time but I finally arrived at North River Gap (65.8 mi) at just after 1000. I was now very tired and the legs were hurting. Debbie, my wife gave the quads and calves a good massage, I ate a little bacon, drank some Mountain Dew, Gatorade, and an Ensure and was on my way. 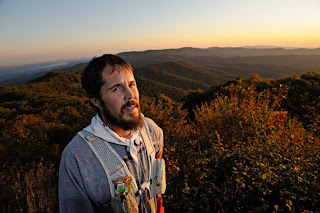 I had just run further than I had ever run and it was beginning to show, about a half mile up the trail to Lookout Mountain my stomach revolted and I lost my breakfast. This was probably the best thing that could have happened at this point. I recovered very quickly, drank a little water and continued to trudge up the trail to the Lookout Mountain AS (71.9 mi). I did run up on a black bear about half way down Lookout Mountain, he quickly retreated into the woods (I must have been very intimidating, zipping along at the speed of a turtle). I was hurting pretty good when I rolled into Dowell's Draft AS, but sympathy was getting harder to come by. Debbie started to crack the whip at this point and told me that I wasn't getting any closer to the finish line by sitting in the chair, so down the trail I went and up what I thought was the toughest climb of the race, up Crawford Mountain. This massive climb went on forever, consistently steep and offering no relieve until reaching the top. And at this point "relieve at the top" was relative. My daughter Abby met me about a quarter mile from Dry Branch Gap AS and ran in with me, this was a great motivator as we started to get close. It was now about 1600 and I knew that the next 8.8 mi stretch up and down Elliot's Knob would take about 2.5 hours and I wanted to get it done prior to the sun setting. The climb was slow but not near as painful as the previous climb, after about 4.5 miles I started down the mountain. As I was heading down a very steep jeep trail another bear walked out onto the road, took a look at me and ran for his life. It was at this point that I wished that east coast black bears were more aggressive and that he would turn and attack and put me out of my misery, no such luck-keep running. I rolled into the last AS at sunset (95.3 mi) got some quick encouragement and headed toward the finish. The last leg was uneventful, other than the fact that I was through my second sunset and back into the darkness. I had a real sense of wanting to be done, but was unable to run even gentle uphill sections. After about 1.5 hours I could see the lights of the finish line. I was met by Abby and my son Josh for the final push up to the finish line and crossed at 2026 on Saturday night (26h:26m:05s). I turned and hugged a huge Totem Pole in front of the Boy Scout Lodge (a finishing requirement), and shook the hand of the race director, Clark Zealand, as he presented me with my 100 mile Grinder Belt Buckle. As I reflect on the race a couple of days removed I hope that I don't minimize the impact that this event has had on me. When I started down the trail on Friday, I asked God to provide direction and submitted to His will for the outcome of the event. Throughout the day I relied on my Faith to pull me through some low points and was rewarded with gifts and direction that I am still trying to grasp. Very rarely do things turn out to be exactly what they appear to be but for me, on this day, the Grace of God was just that - Grace, freely given and humbly accepted. Thanks for a great event, I look forward to the last two Beast Series events. my first and foremost impression was, it was a climber's course. it was uphill both ways. (actually, the turn around was at 4,400+ feet and the start was on the valley floor, so the return must have had some downhill.) at least it seemed like it was. my second impression was, the footing was more technical and rockier than i thought it would be. this course had miles on end of the rough stuff. in the later miles when i was exhausted, the climbing and the rocky trails were a big challenge. my third impression was how the sleep deprivation played a role in the race. i don't hardly hallucinate anymore because i'll just go ahead and give in and take a nap if i need to. i was planning on taking one or even two naps for this race if i wanted too. but i ended up just spacing out my caffeine and did not take any naps. around mile 65 on saturday afternoon i was getting a little loopy headed and, sure enough, i went off course for 15 minutes. the trail was well marked, i just wasn't paying attention. (i heard lots of people went off course, but i attribute that to the mostly night time running and not thinking straight. the course markings were excellent and plentiful.) when the second nightfall came, i started seeing faces in the rocks and sticks on the trail. if i looked way up the trail, i would see cabins with people on the porches and llamas and cows and horses in the yards. i knew all of this was imaginary, so i made myself only look at the trail about 10 yards ahead. not too close or too far away. this kept the images under control. still, when i would stop to pee the bushes and plants would move and vibrate. the whole event was first rate. i can't think of any complaints. it was neat seeing some huge mountains in the distance and knowing you were crossing them. on the return trip, it was discouraging seeing some huge mountains in the distance and knowing you were crossing them. all of the entrants seemed to be well prepared and in the best shape they could be in. the hype must have made them wary of the race. vicky kendall outran me. actually, she outclimbed me. almost everyone had a good race. one secret to doing well on this course will be how far you can get before the second nightfall. when the sun went down the second time, darkness and sleepiness and steep technical trail all combine to make your forward progress slow down. i say this after every race and i am saying it gain after this one, "now i know i need to train harder so i can do better next year". It was an honor to award 62 Grindstone 100 belt buckles to the official finishers this past weekend. Ideal weather conditions contributed to an incredibly low drop rate (only 12 people dropped). Don't start thinking this course is easy though - these Grinders are tough!!! Official Results will be posted very soon - stay tuned. 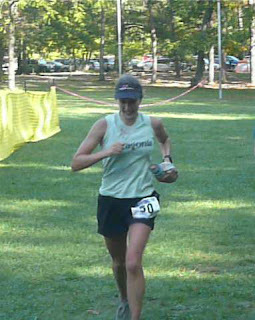 who just became the 1st Annual Grindstone 100 Miler Womens Winner. Click on Kristin Moehls name to see her splits and times at each aid station. who just won the 1st Annual Grindstone 100 Miler. Click on Harland Peelle name to see his splits and times at each aid station. This call is a little broken up, but clears up near the middle. We are having technical difficulties connecting to the internet at our remote location, please be patient as we continue to work out these challenges in our first attempt at a webcast. Poor Recording on this one. We apologize for the technical difficulties.